Jet skis are gas-powered machines that travel through the water like a boat. Typically one passenger operates the machine. 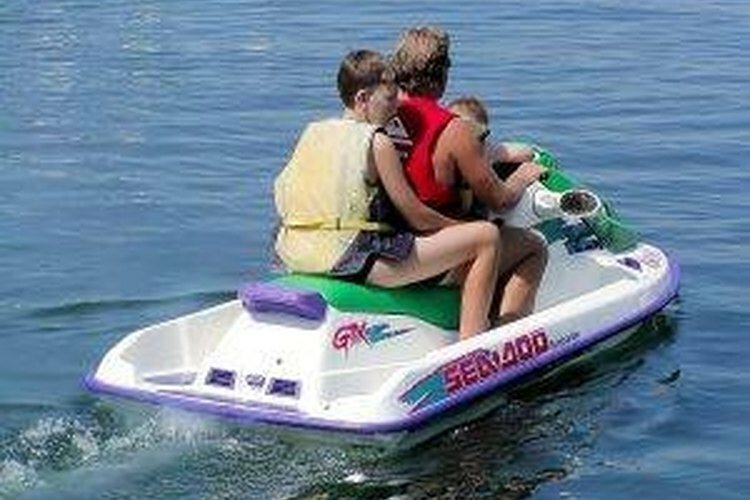 A jet ski can accomodate up to three or four passengers on some models. Popular among water sport enthusiasts, the jet ski is designed to provide entertainment in an aquatic setting. There are two types of jet skis. The solo is meant for one person and the operator has to stand to operate the jet ski. The sport jet ski has a seat and can have an extended seat for up to three people. The function of a jet ski is that it can provide recreational entertainment and transportation to the operator on a body of water. Jet skis can accommodate one to four adults comfortable depending on the model and the motor sizes can allow the craft to reach high speeds between 15 mph and 60 mph. Jet skis can serve as race machines in order to compete in tournaments and races. Jet skis can pull passengers behind them in a small inner tube or other floating device. Jet skis should be driven with caution and safety in mind at all times by following marine instructions and heeding to other water traffic to prevent accidents and injuries.